VERiS is a solution for insurance companies that provides complete lifecycle support for contracts, from the initial contact and quotation all the way to the expiration or termination. It covers the full range of general insurance products (Life, Property and Casualty) for individuals, professionals and businesses. VERiS is commonly used for life, casualty and pension insurance, and in the property insurance area for building insurance, car insurance, plant and equipment insurance, agricultural/crop insurance, household and liability insurance. 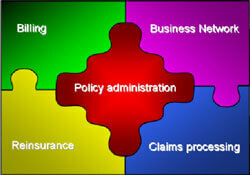 VERiS allows defining new insurance products, as well as combined insurance products and packages. VERiS is based on a very stable, robust and secure IBM i server using the DB/2 database. Originally designed for 5250 deployment (character based), VERiS has been redeveloped with the Visual LANSA Framework for Windows client/server deployment. Customers can choose between these two user interfaces. VERiS includes web self-service access for brokers and policyholders plus automated data exchange via web services with brokers, regulatory authorities and other third parties. Products and services provided on-line are 100% browser based (nothing to install on the client).